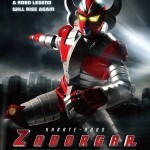 Karate-Robo Zaborgar is on Netflix Streaming! Well for those wanting to check out out, it is now availible for streaming on Netflix! So if you want some hilarious tokusatsu action to watch, go check it out!